EDITORIAL NOTE: Following the publication of this Drink Tank post, the author received correspondence from the Advertising Standards Bureau (on 22 December 2015) offering their sincere apologies for the delays experienced, where “through an administrative error by the Advertising Standards Bureau, your complaint was not forwarded to ABAC as per established process.” The complaint has now been referred to the Alcohol Beverages Advertising Code (ABAC) Panel for further assessment. 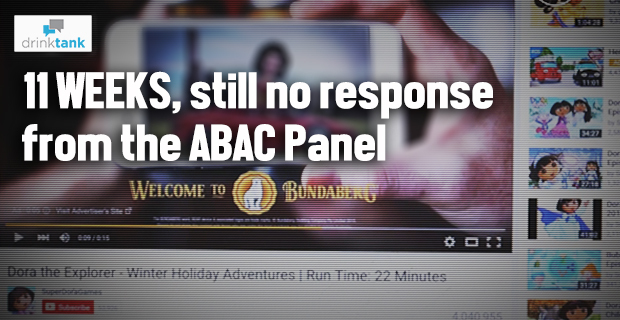 See: “ABAC didn’t ignore your complaint, we were just being incompetent, says Advertising Standards Bureau“. Until resolved, this practice creates bad PR for everyone. It makes alcohol companies look desperate and mercenary. And if you own the IP for Dora the Explorer or, say, Frozen, would you want alcohol companies messing with your child audiences? The Alcohol Beverages Advertising Code (ABAC) is the voluntary, alcohol advertising code and complaints scheme whose Management Committee represents Australia’s beer, wine, spirits and advertising industries. The Australian government is also represented on the Committee, through the Head of the Department of Health’s Drug Strategy Branch. In 2012, the ABAC Complaints Panel dismissed a complaint (118/11, 14 January 2012) about an alcohol ad placed prior to a children’s game on a children’s website aimed at 3-8 year olds. On that occasion, the Complaints Panel wrote that “the Panel is only permitted to consider whether the content (not the placement) of the advertisement breaches the ABAC”. According to ABAC, the Code is the “centrepiece of Australia’s quasi-regulatory scheme for alcohol advertising”. Former Senator the Hon Alan Ferguson was appointed the inaugural Chair of ABAC’s Management Committee in July 2015. The Chief Adjudicator of the Complaints Panel is Professor Michael Lavarch AO, a former Commonwealth Attorney-General. The Hon Sussan Ley MP, the Minister for Health, did respond to my letter raising the issue of alcohol spam to children watching age-appropriate content online. She advised that the Department referred my letter to the ABAC Management Committee for consideration at their meeting on 24 November 2015. Among other recommendations, it called for changes to the ABAC Code to ensure that it covers alcohol advertising in all media, including user-generated online content (such as YouTobe) (pp 119-121). It called on ABAC to perform annual monitoring of alcohol marketing, with public reporting (122-123). At the time I made a complaint to the ABAC Panel, I sent the same complaint to the Alcohol Advertising Review Board (AARB). The AARB found that by streaming its ad with children’s content on YouTube, Diageo was in breach of the provision above. You can read the AARB’s determination here. This post first appeared 16 December on Sydney Health Law, the blog for The University of Sydney’s Centre for Health Governance, Law and Ethics. If you are interested in studying health law, visit the Sydney Law School for further information about their postgraduate programs. It is simply naive thinking of ethical obligations from business people involved in the alcohol industry. As rightly outlined, it is the nature of the business purpose to increase sales of the alcohol drug. It is all about profits and market share, catchments and targeting of new customer groups for sustainable growth. It is purely a fact that on the strategic road maps one can find new customer groups like women and adolescents though the industry knows about the catastrophic vulnerability especially of the latter one. In particular young people (drilled down to kids age) are being targeted by the marketing giants of big alcohol. Future potential they call them. This people must be held responsible for the harm caused by them. 40-60 % of suizides are caused by alcohol. Mostly as an initial trigger and without any comorbidity health issues. Modern science explaines by using MRI scans that alcohol is manipulating GABA-receptors (amongst others) which leads to depression and severe brain diseases like psychosis. It is a grade A carcinogenic agent and harms literally every organ of the human body. It is a dirty and highly potent drug. As simple as that.